Heading off to school through inclement weather? 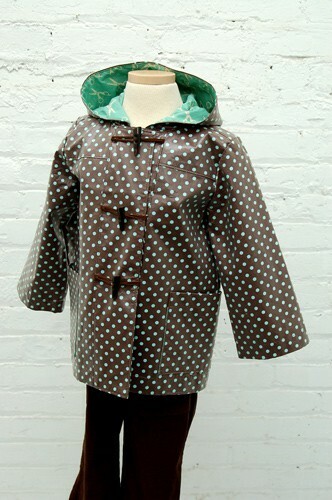 This unisex, hooded jacket and coat pattern handles the elements as either a raincoat or a winter jacket. 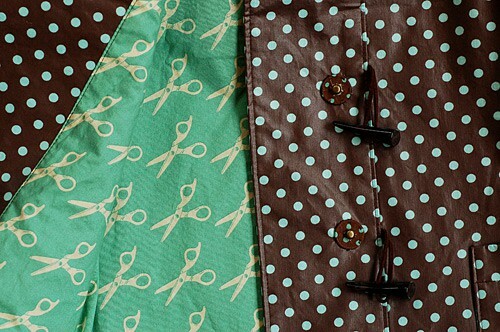 Pattern features patch pockets and choice of duffle closure details. Optional removable quilted lining can be made with or without sleeves for additional warmth. Share your photos on Instagram with the hashtags #schooldaysjacket and #oliverands. After successfully sewing this pattern, you will have developed the following skills: lining, patch pockets, and set-in sleeves. Wool coating (including melton or boiled wool), oilcloth or laminated (raincoat) fabrics, denim and canvas. Lining: light- to medium-weight fabrics like quilting cottons, broadcloth, or acetate or rayon lining qualities. Quilted Lining: Cotton fabric with batting, cotton fabric with micro-fleece, or ready-made quilted fabrics. Jacket: Thread, 2 large snaps or Velcro© patches for front closure. View A: 3 toggle buttons with 1 yard of leather or fabric cording (handmade or purchased). View B: Three 3/4" buttons. Optional Insulated Vest: Thread, 1 1/2 - 4 yards of 1/2"-5/8" double-folded bias tape (purchased or handmade), nine 3/8"- 1/2" buttons, 18" of 1/4"-wide elastic or elastic cording. Chest 26" 27" 28" 29" 30"
Length* 13 1/4" 14 1/2" 15 1/2" 16 3/4" 18"
Sleeve** 15 1/4" 16 1/4" 17 1/4" 18 1/4" 19 1/4"
Chest 31" 32" 33" 34 1/2" 36"
Length* 19 1/2" 21" 22 3/4" 24 1/4" 26"
Sleeve** 20 1/4" 21 1/4" 22 1/4" 23 1/4" 24 1/4"
In the town where I live there was a factory which built snooker tables (pool or billiards might be more familiar terms?). A couple of years ago I bought an off cut of green baize and I've been waiting for an opportunity to make something brilliant. This pattern made it possible. It took a while to assemble it after printing it out, but it was worth it. The instructions were written by someone who understands how to communicate with new needlefolk (if that's' a word). They were full, clear and didn't assume knowledge and the diagrams actually made sense. I really enjoyed making it and I'm proud to see my grandson wearing it. The coat turned out very well. The pattern was easy to follow, I lengthened it suit slim 3year old. Very happy ...thanks. Excellent instructions that really hold your hand. Such a cute and pro-looking little jacket! The sizing is really true to the listed measurements rather than age- so although my two year old measured more like a one year old, I made the 2T size and it is definitely a bit too wide. I'm more than happy to roll up the sleeves and have her wear it two years in a row though! Detailed, clear, rewarding pattern. So glad I dove in and tried this! This is a fantastic pattern - probably the best I've seen. It is so easy to follow and the end result is gorgeous on my 2 year old. I have made a size 2,3, and 5. Total of 4 coats. The pattern is soooo simple. I made a toggle closure, button with tabs and buttons with no tabs. Love this pattern! I recently purchased the School Days Jacket for a second time in the larger sizes because I was so impressed with the jacket made up in the smaller sizes. I have made this jacket twice before and am looking forward to making it in the larger sizes for my older boy over the next few years. School Days Jacket - a success!! 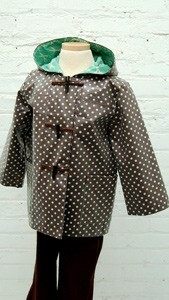 This was my first ever coat and this pattern made it very easy to complete with my little ones approval! I opted to use magnetic closure as my 3 year old has trouble with buttons & toggles. Thank you for the great pattern and the sew along helped break down each task to manageable pieces. I simply adore this pattern! I purchased this pattern at a local fabric store along with some laminated cotton. It was my first time sewing with that type of fabric and also my first time sewing with one of your patterns. I was more than a little nervous, but was pleasantly surprised at the clarity and ease of understanding and following the instructions. The jacket turned out beautifully and my daughter loves it! Thank You. The coat turned out very cute. I should have used a "coating" fabric, but instead wanted a "lighter" version, so tried it with a corduroy. I made the jacket in the largest size, because my DD is 6, but tall, like an 8 year old. Should have taken that into consideration, I guess....so, I revamped the style slightly, to fit the fabric, I tapered the sleeves slightly, and I pleated the back and added a bow....looks great now, but before, it looked like a big balloon on her! Great Pattern Though! I will do it again!!! I just finished this pattern for my 16-month old, and I can't believe *I* made it! It truly was not difficult to construct, just a little time-consuming (mostly cutting out all of the pieces). I absolutely adore the jacket and will absolutely make another one in a year or two when he outgrows this one. Great pattern. Well written. I would have liked a few more pictures throughout the instructions but I also write patterns (knitting/crochet/making soap/lip balm/etc) so I understand how it can be difficult to show every step sometimes. I made this coat for my 3 year old. It is the first coat I've ever made and everyone LOVES it. I probably could have made it in a day if I would have chosen a full free day to do it. I cut the patterns one day and made the entire coat the second day. I will very likely be making more of these. I'll be getting more patterns from you as well. It had the 4 scissor difficulty so I was a little nervous to start it but it came out really well. I'm very happy with it especially since I've never made a coat or worked with the heavier fabrics like these. I bought this pattern in the smaller size range a couple of years ago and sewed one of up for winter for my two year old earlier this year. I found it quite hard to get affordable bright wools (in the UK), but in the end used a lovely soft red blend with a fun Cat in the Hat flannel lining and the detachable body lining in a sherpa-like fabric. It was a really rewarding sew - not quick, but the instructions were clear and broke all the stages down well. I always appreciate the level of illustration in Oliver+S patterns! I inserted magnetic snaps into the front plackets so that my little boy could pull it open himself if the toggles weren't done up. He's had LOADS of compliments on it and everyone is always amazed that it was home-made as the finish is so good (a feature of the pattern, not my sewing skills!). I just bought the next size range up as I definitely plan to make more for him in the future. 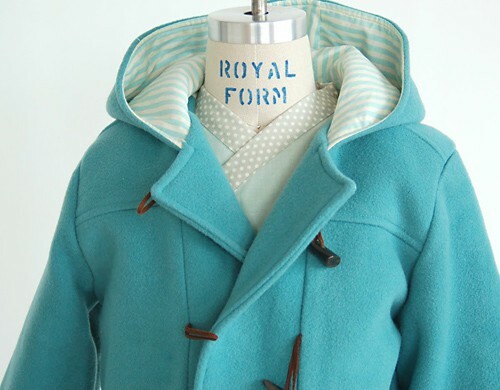 If only I could source a teal wool like the one in the sample photo! I love beautiful wool coats for myself, but they are so hard to find for toddlers (unless you spend mega bucks). I really dislike all the pink puffy coats for little girls, so I was so glad to find this pattern! I sewed a beautiful gray Pendleton wool coat with navy lining and real horn toggles in a size 4T for my daughter. I have received so many compliments on it. It's functional, comfortable, and super warm (thanks to the heavy wool and Thinsulate inner lining I added). Despite the number of pattern pieces a coat requires it was easy to sew and I love how it came out. Bonus, it cost about $60 in materials, will still fit next winter, and be good for baby number 2! Thank you for the lovely pattern! I made 2 of these coats for my granddaughters, I found the pattern really easy to follow, making the second one in less than a day. I had to make a slight adjustment to the hem on the lining, I also did one with buttons and the other with toggles, both look great. Thanks for a great pattern. I made two of these jackets in wool for my grandsons in October and December. This pattern is one of the most rewarding projects I've ever done. And using wool was probably easier than any other fabric I could have chosen. The boys love them and I am truly proud of them! Good design, but construction directions needs reworking. I did enjoy making this coat. Everything comes together in a very natural way. The coat gets LOTS of compliments, and everyone who sews who sees it is sincerely impressed. The only problem I have with it is the construction directions are NOT the best way of assembling the jacket. I was constantly switching thread and getting up to iron. Instead, work on a piece until you have to iron or topstitch, then move on to the next piece, if possible. When you have gone through everything, then iron what you can, then topstitch. Overall, I think I spent 12 hours making this jacket over the last week. Not the best use of time. Different construction alone will reduce that. It took me 2 hours to set in both sets of sleeves (lining and shell) because I have only done set-ins once before. Once I get the kinks worked out, it should take 6 hours to make one, from interfacing to completion. I have photos of the two completed coats on Facebook in the "Fitchburg Sewing Club" group. What a wonderful pattern, i have successfully made three coats from it. The results are highly professional and very easy to understand. I have only been sewing children's clothes for about 1 1/2 years and I have made numerous Oliver and S patterns all have been superb. Easy to follow, step by step hand holding and delightful results I couldn't be happier with the coats I have made. Everyone who sees this coat cannot believe I made it! I used a navy herringbone wool for the outside and the American Jane 'rulers' print for the lining. It worked so well for both my daughter and my son, so we've gotten many years of use out of it, especially since I made it a bit big and rolled the sleeves up when they were younger. The leather cord and plastic toggles I purchased with the pattern didn't last, so I replaced them with elastic and wood toggles. I only wish I had thought to put a hanging loop on the inside. The pattern is easy to follow, like all Oliver + S patterns, and the coat still looks brand new. I loved this pattern. Instructions were detailed and easy to follow and the finished product looks great. I have made it in two different sizes and am about to sew it again for a friend's baby. In the printed version of this pattern and in the first digital release, the instructions contained a very minor error. Step 1 in the section entitled "Prepare the Lining and Facing," should read "If you’re using Velcro© for the front closure, cut and stitch the "soft" side of two square pieces...." This error has been corrected in the version of the pattern currently available for download. Discussion on the digital school days jacket + coat sewing pattern from the Oliver + S Discussion Forums. Find and share more photos on Instagram using the hashtags #schooldaysjacket and #oliverands.